What does files with .txt, .log, .h, .c, .php, .reg, .sql, .bat, .dat, .html, .ini, .nfo, .html, .xml and etc has in common characteristics? Yes, basically they are all text files, or used to represent that the content of the file with one of the extensions is in text format which viewable with any text editor. So you would guess that all these files will be previewable in Windows or Microsoft Outlook preview pane. But in actual reality, it’s not as not all file types and file extensions are associated with the built-in preview handlers (such as Microsoft Windows TXT Preview Handler) by default. Although there is the limitation of one file type or ext can only be associated and thus rendered by one previewer engine only, however, each preview handlers can be used to support multiple file types and extensions. In this case, Preview Handler Association Editor will come in handy to allow users to associate a particular preview handler with a or a few file types with different extensions so that those would be previewable, where they’re not by default. Previously, to expand the file types that a previewer can handle involved registry hack and tweak, or support provided by third-party preview handlers. Preview Handler Association Editor is a tool that makes it easy to edit preview handler registrations for particular extensions. It’s useful too to handle the restriction mentioned above where only one previewer is allowed for each extension. When you have two ore more different preview handlers for a file type, the Preview Handler Association Editor also allows you to easily switch back and forth between them with relative ease. When the app loads, it looks to the registry for all registered preview handlers. It then loops through all classes and extensions in HKCR to see if each has a preview handler registered, and if it does, which. Once that data is loaded (which on my machine takes approximately a second), the interface displays a combobox allowing you to pick any of the registered preview handlers. The listbox with checkboxes of classes and extensions is then refreshed to show all of the classes/extensions; those associated with the selected preview handler will be checked. Checking items that aren’t checked causes them to be immediately associated with the selected preview handler, and unchecking checked items causes them to be immediately unregistered for the selected preview handler. You can also check the “Only show classes associated with this handler” check box to filter down the list to make it easier to see all of the extensions/classes currently associated with the selected handler. 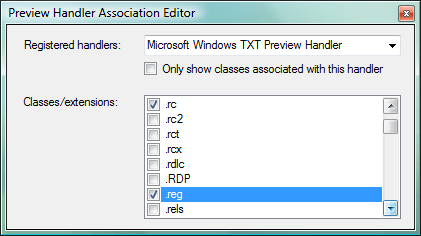 Download Preview Handler Association Editor.